MARCH 2007 -- Can you believe it? It is already the beginning of March. Spring is only a few weeks away. Now is the time to think of Degrees and obtaining new members. The Membership Committees face one of the hardest tasks of all. Our Publicity Committees should be there paving the way for them. By making the people in your community aware of all the good work the Grange does for others, you help pave the way for the membership committee to get those new members we so desperately need. No one wants to join an organization on the decline. We have to emphasize our good points. Be enthusiastic. Think Positive. Let others know what you are doing. If you don’t tell others — no one will. When Degree Night comes — don’t complain. Be glad you have candidates to confer the degrees on. Be enthusiastic in your work. You are making a lasting impression on these new members and we want this enthusiasm to be contagious. These new members will play a vital part in your Publicity/Information projects. Remember, word of mouth is still the cheapest, fastest and most effective form of publicity. These new members will talk to their friends and neighbors. What happens the night of degrees will make a lasting impression. While you are listening to the Degree Work, listen for the First Degree Master to talk about the humble grass. Apply these principles to our Grange Work. Let’s spring to life. 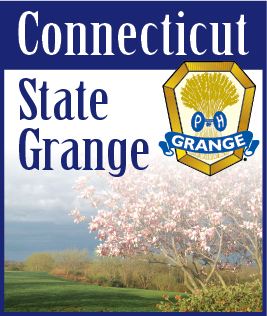 Let’s bring the ideals and objectives of the Grange back with us.